Are you looking for information on how to build a bunk bed? With the right materials, tools, and instructions, it's not difficult to build a set of your own. A bed is one of the largest pieces of furniture you'll probably bring into your home, so just the size of a bunk bed building project will take some organization. Bunk beds are particularly challenging because they are stacked, so they take up quite of room, and beyond the construction, there are some logistical considerations. Your best approach is to build each bed separately and then join them together in the room where the bed will be situated. A bunk bed frame is really a pair of large wooden rectangles, like flower boxes attached to posts, so start there. The following dimensions will help you understand some of the material requirement for building a simple stacked bunk bed. These basic measurements will give you an idea of the wood and dimensions you'll be dealing with. After you measure the mattress, frame or other insert you have in mind, you'll be in a better position to tweak the measurements to conform to your requirements. The configuration of this basic bed is two rectangles with bottom supports that are attached by corner uprights. The bottom bunk is positioned 10 inches above the floor, and the top bunk's frame begins 2-3/4 inches down from the top of the upright supports or legs. Furniture this large will need a big workspace. One great option is to wait for a sunny day and move the work outdoors. Bunk beds can take a lot of punishment so don't skimp on the bolts and screws. Constructing a child's bunk bed is a more complicated process than the one above because of the added safety features. Children die every year from suffocation as a result of bunk bed mishaps, including getting caught in between the mattress and the wall, between the mattress and the mattress support, and becoming entangled in the slats of the rails or between the bottom of the rail and the top of the mattress. This sounds serious because it is. If you plan on learning how to build a bunk bed for a child, take a few moments to review a detailed set of plans with lots of onboard safety features. Make sure that the wood you use is good quality, and take the time to sand and finish it well. Countersink the nails, and fill all of the holes. If you are long on enthusiasm but short on time, you can buy a bunk bed kit. Kits help you get to the creative part faster because the tedious work is done for you. While you're thinking about bunk beds, why not take a look at some of the newer bunk bed styles and explore a few loft beds too. 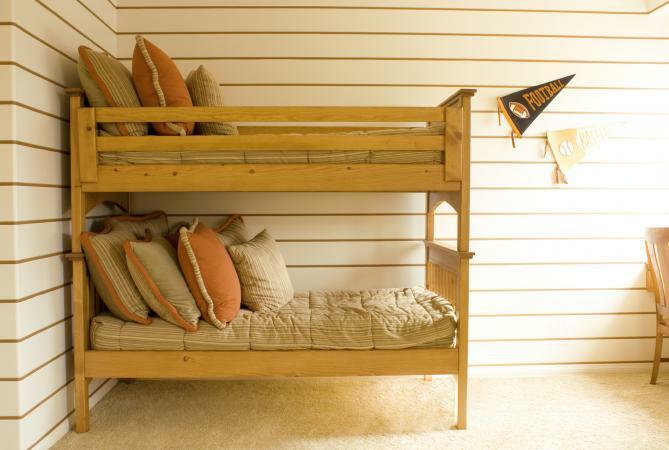 Some loft beds include two beds, with the bottom bunk turned perpendicular to the top bunk. If you haven't explored some of the new styles out there, now's the time.